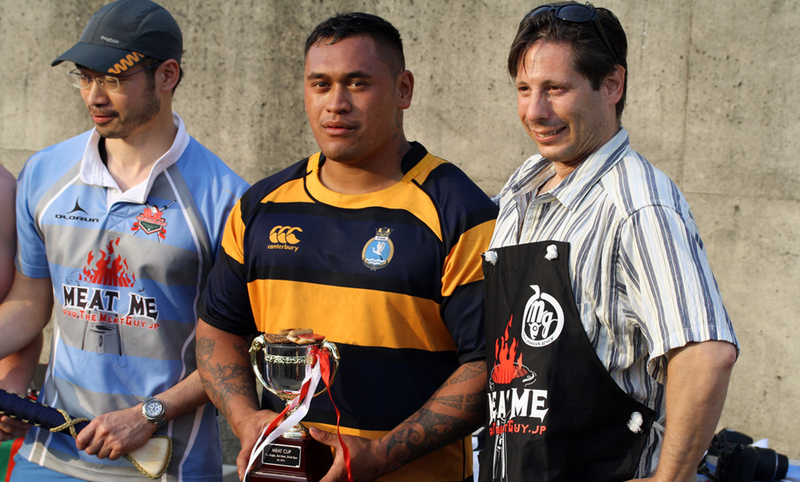 On May 25, Tokyo Crusaders co-hosted The Meat Cup together with George Washington RFC (US Navy) – a Rugby 10s tournament, on Jinmuji Base, Yokohama. Six teams participated in this first edition of what we hope will be an annually returning tournament, and we congratulate Te Mana of the New Zealand Navy who were visiting Japan and proved that sea legs can also be useful on a rugby field. We extend a warm thank you to our sponsors – The Meat Guy and Synergy Center for making the day possible, and for their generous prize donations for the raffle. Also, thanks to all participating teams, All France RC, Dandelions RFC, George Washington, Misawa Snow Devils and Te Mana for making the day what it was. You are all warmly welcome back to compete for the cup again next year. All participating teams donated 10,000 yen each to the Make-A-Wish foundation, sharing some joy with the world. The Cru was unprepared to face the first opponent: setting up a BBQ. This preoccupied most of the team before the first game, but there was still enough time for the usual 5 minutes of warm-up. With everything else off-time at the tournament, somehow the only thing on-time was the rugby game schedule. Travis “You couldn’t see me because I was in the back row of the haka” Dixon made sure at least one Kiwi wasn’t sober to start the tournament and was more than excited to show off in front of his new Te Mana friends. Well, the Cru were a bit unorganized and sluggish during the first game against a highly motivated GW squad, who somehow passed the breathalyzers at the main gate. A couple of quick trys by the Navy boys put the Cru in a hole going into the 2nd half out of which we never recovered. But, as Roy Yorke noted, we ‘intentionally’ lost the game so GW could suffer Te Mana. Feeling sour about the 1st game and with the BBQ finally firing up, a literally hungry team of Crusaders kicked off the second game against the Dandelions. Had someone fixed the bracket a little more in our favor, this could’ve been our first game and possibly sent us to the cup final. We were assured of not being treated unfairly as our captain for the season, Evan “the C in Cru is for c@#t!” Hitchman was the ref. The Cru scored early on Tom Ball’s assist to Takushi Hayashi on the wing for an easy try. The Cru scored plenty of tries in the 1st and 2nd half, with Tom Ball and Travis Dixon adding to the tally, and Takushi Hayashi and Roy Yorke scoring two tries each. We were able to shut out the opposition and started to play like our mid-season form again. This was for the Plate, 3rd place in the tournament. Literally hungrier than ever, the Cru took to the pitch against US Air Force – aka Misawa Snow Devils. Playing our last Rugby Union minutes of the season, we knew we had to play hard to win against a team that badly wanted to beat us. Kenji Yoshioka and Paul Skurr had big runs enabling Tom Ball to find Roy Yorke in the gap giving the Cru’s first try and Yorkie’s first of three for the game. Yorkie and Travis scored two more before the half ended. Going into the 2nd half, we wanted to put this game away. Again Roy Yorke and Travis Dixon entered the try zone. After the 3rd game, we were finally able to eat and drink like we had been promised. After two hours of Judge Tooley calling raffle numbers, the prizes were all gone and the tournament was finished. This made plenty of time for Travis to unnecessarily give us more insight into his harrowing life with stories too awkward to repeat here. A big thanks to Gaz, Marc, Aiko, and Takumi for assisting the Meat Guy with cooking as well as Jonas handling the money and programs, and last but not least, new Cru Superfan Eimi for taking over 500 pictures of the tournament!